Whether you are visiting family in Detroit for Thanksgiving this year or seeing the sights, it is never too early to start planning the holiday weekend. Fun things to do in Detroit during Thanksgiving weekend include concerts, musicals, sports, and one of the best Thanksgiving parades in the nation. Keep in mind that Detroit is famous for mixing things up ​weather-wise, which means you can never rule out temperatures in the 70s and/or snow over the holiday weekend. That being said, if you are from out of town, you should pack for what is typical—temperatures around 40 degrees. There are several Thanksgiving-related events scheduled in the metropolitan Detroit area, including Detroit's Turkey Trot (featuring the 10K Turkey Trot and 5K Stuffing Strut). There are also two combination events—the popular Drumstick Double (10 km and 5 km), and the Cranberry Combo (1 mile and 5 km). For over 35 years, runners and walkers have had the fun of walking the Thanksgiving parade route before it starts. Much more than a variety of races, thousands of participants dress in costumes and strut their stuff in front of people gathering to watch the parade. The events start off at 6:30 a.m. with a costume judging contest. Then the walkers and runners take off with staggered time starts. Register online. The event start/finish and the expo is located at the Cobo Center in downtown Detroit. America's Thanksgiving Parade, one of the country's largest and most impressive parades, takes place on Thanksgiving Day in downtown Detroit. Every November something magical happens on Detroit’s historic Woodward Avenue, a holiday tradition that dates back to 1924. Thousands line Woodward Avenue Thanksgiving morning to watch the huge floats, colorful helium-filled balloons, uniformed marching bands, dance teams, and equestrian units. The Parade starts off from the corner of Kirby and Woodward at 8:50 a.m. In the days leading up to the parade week, you can even take a studio tour to see how artists make the floats and get an up-close preview of the new floats. The tours take one hour and are not available during Thanksgiving week. Reservations are needed. There are several concerts and shows in and around the Detroit area over the Thanksgiving weekend. If you love live music, here are a few ideas. Louis the Child - Masonic Temple: Wed., Nov. 21, 9:15 p.m. Generate Axe ft. Vai, Wylde, Malmsteen, Bettencourt, and Abasi - The Fillmore: Wed., Nov. 21, 6:30 p.m.
Brian Setzer Orchestra: Christmas Rocks - Fox Theater: Sunday, Nov. 18, 7:30 p.m.
Michigan Opera Theater - The Nutcracker - Detroit Opera House: Saturday, Nov. 24 at 2:30 p.m. and 7:30 p.m. and Sunday, Nov. 25 at 2:30 p.m.
A Very Electric Christmas by Lightwire Theater - Music Hall Center for the Performing Arts: Nov. 25, Nov. 26 and Nov. 27. Elf The Musical - Fox Theater: Tue., Nov. 20, 7:30 p.m., Wed., Nov. 21, 7:30 p.m., Fri., Nov. 23, 2 p.m. and 7:30 p.m., Sat., Nov. 24, 10 a.m., 3 p.m. and 8 p.m. and Sun., Nov. 25, 2 p.m.
As might be expected, Thanksgiving also marks the beginning of the holiday season and cold-weather activities. The ​Rink at Campus Martius Park opens its gates Turkey Day weekend, offering ice skating for the entire family in the heart of downtown. The illuminated trees set the stage for a winter wonderland. Once the rink opens for the season, you can skate every day including holidays. Rental skates are available and all experience levels are invited to skate at this beautiful outdoor urban rink. Earlier in November, the Detroit Zoo kicks off its annual Wild Lights, where more than five million LED lights illuminate the buildings, trees, and sculptures throughout the front half of the zoo. Wild Lights thrills visitors for 24 nights beginning November 17, 2018. There will be holiday entertainment and special activities for guests of all ages. Special highlights include the “Polar Express 4-D Experience” and skating on the synthetic plastic Glice skating rink for an additional price. Carousel rides will also be available for purchase. The Wildlife Photographer of the Year exhibition in the Ford Education Center is included with admission. Tickets are required and can be purchased in advance. Thanksgiving wouldn't be Thanksgiving if the Detroit Lions didn't play football. Since 1934, the Thanksgiving Day Classic has been held in Detroit. Currently, three NFL games are played every Thanksgiving. The first two are hosted by the Detroit Lions and the Dallas Cowboys and the third game with no pre-selected teams has been played annually since 2006. Tickets may be hard to come by, but attending the game is a fun way to bring some tradition to your holiday weekend. The Detroit Pistons compete in the National Basketball Association as a member of the league's Eastern Conference Central Division. Consult the Detroit Pistons schedule and purchase tickets online. They play at the Little Caesars Arena in midtown Detroit. On Friday, November 23 they play the Houston Rockets and on Sunday, November 25, they'll be playing the Phoenix Suns. Or, if you're ready for the ice, head over to Little Caesars Arena—the Detroit Red Wings will have a match the night before Thanksgiving (Wednesday, Nov. 21) against the Boston Bruins. The Red Wings are members of the Atlantic Division in the Eastern Conference of the National Hockey League and are one of the Original Six teams of the league. The team was called the Detroit Cougars when they were founded in 1926. For some, the day after Thanksgiving is the time to go shopping for bargains and holiday gifts. 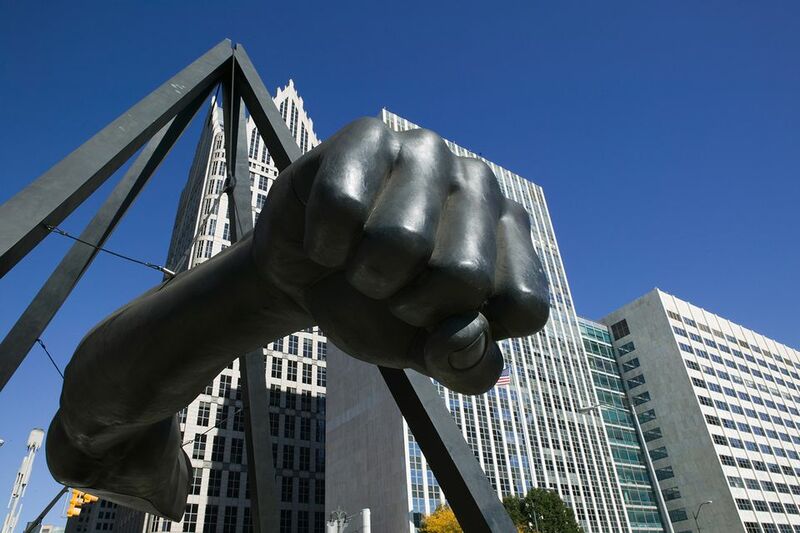 The Detroit metro area offers a downtown collection of independent and brand-name shops as well as walkable shopping districts, outlet centers, mega-malls, and upscale boutiques. In downtown Detroit, you'll find a variety of shops along Woodward Avenue. Woodward Avenue has been completely transformed in recent years, paying homage to the former shopping district. Big-brands like Nike, UnderArmour, Mooselaw, and Lululemon Athletica draw the shoppers. Detroit staples are also sprinkled along Woodward Avenue. Local favorites include Detroit is the New Black, The Handmade Company, and House of Pure Vin. You'll be so busy watching parades, going to shows and shopping that you may be relieved to know that there are some great restaurants in Detroit serving up holiday fare. The Moose Preserve in Bloomfield Hills offers both its regular menu and a special Thanksgiving menu. The Dearborn Inn serves a traditional Thanksgiving buffet in the Ten Eyck Tavern with a variety of salads, a carving station with roast beef and ham, turkey breast and all the trimmings, and assorted traditional Thanksgiving desserts. The Whitney hosts both a Thanksgiving brunch and a traditional Thanksgiving dinner. Early reservations are advised for these popular restaurants. Since you are in Detroit, it makes sense to enjoy a little automotive history. The Henry Ford is a large indoor and outdoor history museum complex and a National Historic Landmark in the Detroit suburb of Dearborn. The nine-acre museum is filled with fascinating exhibits. Popular museum vehicles include several presidential limousines and the Rosa Parks Bus. The museum also features an IMAX theater. Adjacent is the Greenfield Village living history museum. The Automotive Hall of Fame is located next to the Henry Ford Museum. The Automotive Hall of Fame is dedicated to preserving the automotive and labor heritage of Michigan and Detroit.